The solemn act of establishing, or restructuring, a constitution – which is supposed to favor good government that is balanced but competent, moderate but efficient, and accountable but energetic – is a daunting task. In structuring such a constitution, “whether Separation of Powers is an essential and necessary ingredient of good government?” and if so, “what are the subtleties of Separation of Powers?” are questions that need to be addressed constitutionally. After many attempts to revise the current constitution that was the product of the military intervention of 1980, Turkey now faces such a daunting task of establishing a totally new constitution. This study is an attempt to contribute into the current process of constitution making – which will hopefully end with a constitution that is expected to favor the government model that is both democratic and efficient. The principal contribution that this study aims to make, in this respect, is to demonstrate the indispensible significance of a mixed model of Separation of Powers – in which powers are not purely separated, hence, not mutually exclusive, but check and balance each other by compelling their corresponding institutions to share parts of their partners’ powers – for the institutional structure of Turkey’s prospective constitution. 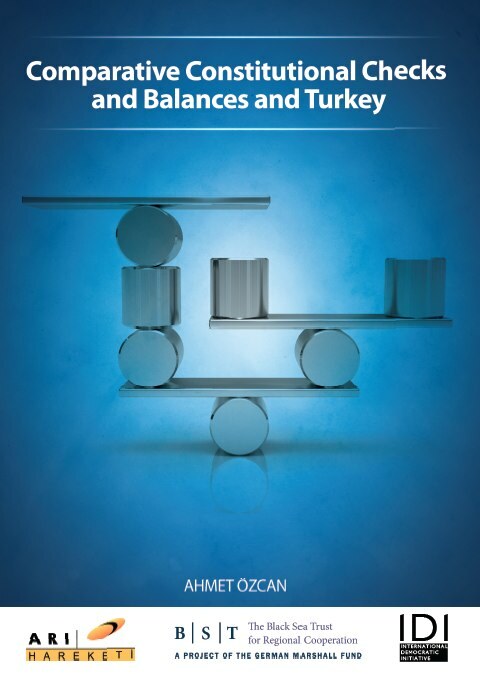 This emphasis on the structural significance of the role of Checks and Balances in the new constitution of Turkey derives from an analysis of constitutional law through a theoretical, historical, and comparative perspective. Citation: Özcan, Ahmet (2012). Comparative Constitutional Checks and Balances and Turkey, Istanbul: The German Marshall Fund of the United States in Collaboration with the ARI Movement and the Black Sea Trust for Regional Cooperation.